Lavender and Skincare - Amphora Aromatics Ltd – Supplier of pure essential oils and aromatherapy Products. Just one of the many versatile uses of Lavender is its great skin care benefits. It is highly praised for its ability to treat various skin conditions from outbreaks of acne, to eczema and even help smooth wrinkles. This makes it an excellent oil to offer great benefits to everyone, no matter what their skin type. It is also one of the gentler of essential oils, meaning it is a good choice for those with more sensitive skin such as children. Here are just a few of the wonderful uses of Lavender in skincare. Use a carrier oil such as Virgin Coconut oil to dilute Lavender and apply to the skin. Alternatively, you can try a ready to use Lavender Gel which is safe to apply directly to the skin. Its soothing effects help to cool the skin and reduce redness. Our Lavender Gel from AA Skincare comes in a handy pump bottle, making it more hygienic for application and minimizing waste. Lavender is most definitely an essential oil you want to have in your first aid box or better still; take a bottle with you when going away to help treat bites, burns and stings. Lavenders’ ability to treat burns was famously discovered by French Chemist Rene Maurice back in the 1900’s when he burned his hand whilst working in the family perfumery business. After sinking his hand into a vat of Lavender, he experienced some extraordinary results which helped heal the burns and even prevent scarring. Although it is one of the gentler oils, Lavender should still be diluted before applying to the skin; our ready to use Lavender Roll on is ideal for those of you always on the go or to take with you on holiday. Lavender can help reduce swelling, reduce itchiness and it can also act as a natural insect repellent to help deter any further insect bites, so it really is a handy oil to keep in your wash bag. Lavender is renowned for helping helping boost circulation. Its anti-inflammatory properties also enables it to soothe redness so if you’re an acne sufferer or have spent a lot of time in the sun this summer, using Lavender as part of your skin care regime can help reduce redness and leave it feeling soothed and refreshed. Lavender water (hydrolate) is the natural by-product of the steam distillation process used to extract the Lavender essential oil. Floral waters make the perfect natural toner; they are incredibly refreshing to use and you can rest assure that you’re putting no nasty chemicals onto your skin. Simply use a cotton pad to gently wipe over the face or if you’d prefer, you can decant the water into an atomizer bottle and spay over the face to refresh and revive the skin. 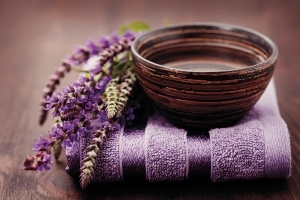 There you have a few ideas on how to incorporate Lavender into your skincare regime. Its wonderfully versatile properties makes it an incredibly beneficial oil for most skin types. What’s more, its beautiful aroma makes it enjoyable to use; offering calming and relaxing properties to help reduce stress and release tension. Thank you reading, we hope you found this useful. Stay tuned for more tips and advice to come as part of our Spotlight on Lavender month.